“Please be simple” I hoped to myself as I neared the horizon. Above: Mt. 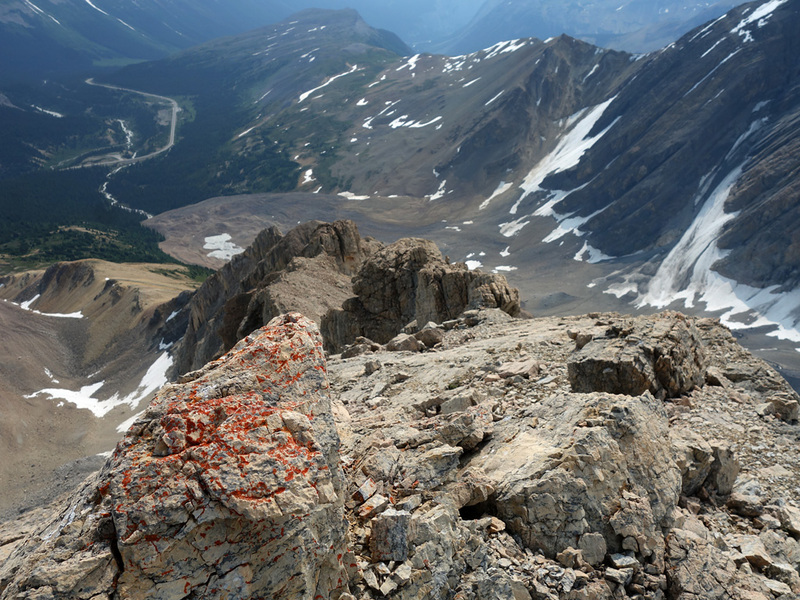 Athabasca and Hilda Peak shot from Nigel Peak South in October 2013. 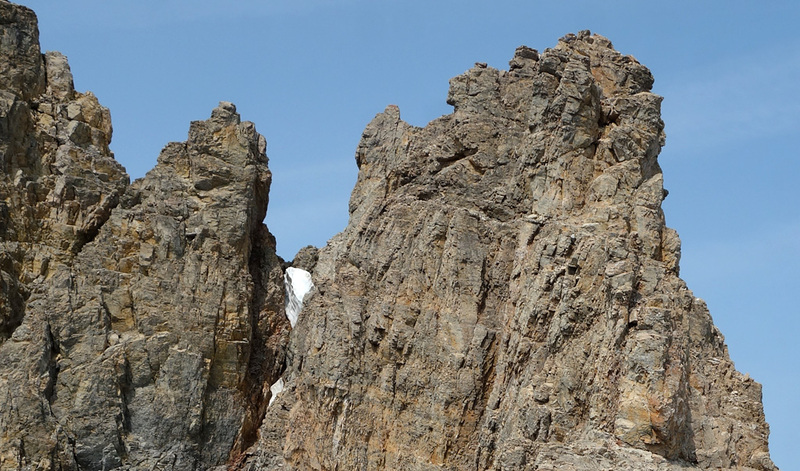 A difficult and often very exposed scramble which ends with multiple pitches of 5.5 climbing. 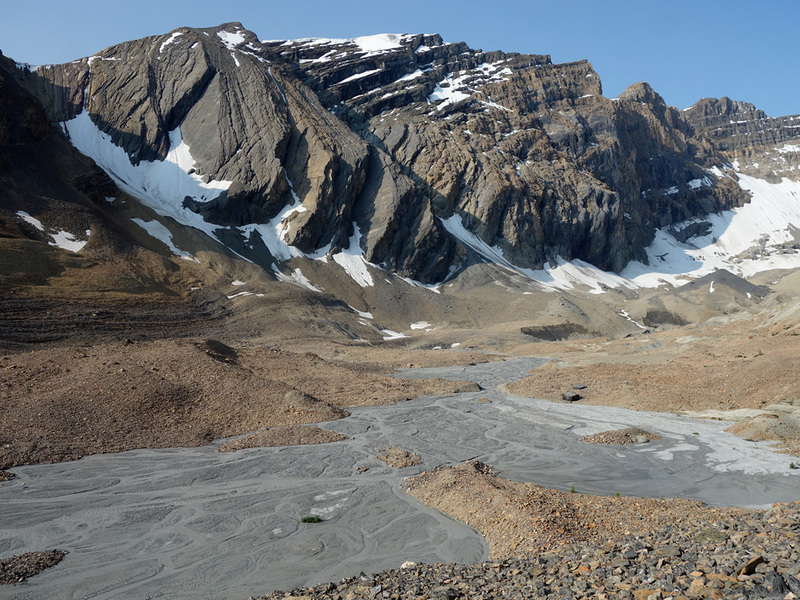 When approaching the Columbia Icefields from the south one can't help but be taken aback by the striking view of the wedge-shaped Hilda Peak, whose sharp summit thrusts over the parkway while the giant Mt. Athabasca looms behind. 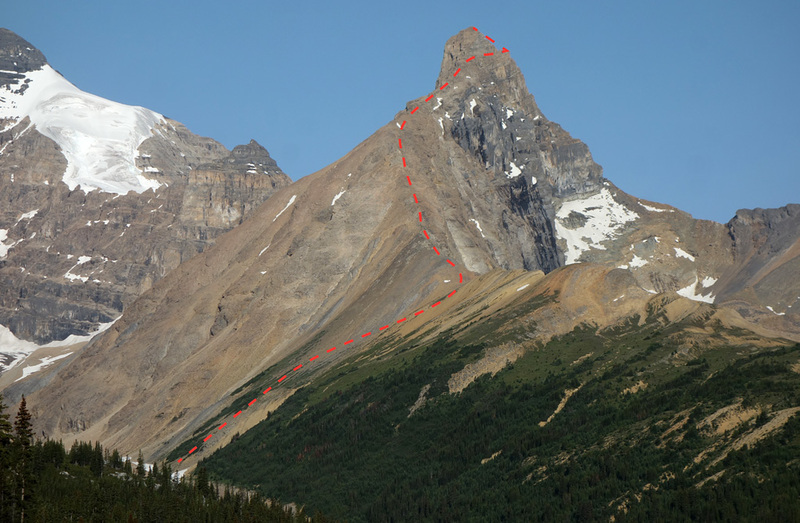 I've had the pleasure of seeing this mountain from a number of fantastic vantage points (Athabasca, Boundary Peak, both summits of Nigel Peak and Wilcox Pass) and found myself becoming ever more curious about this beautiful, yet shockingly undocumented peak. 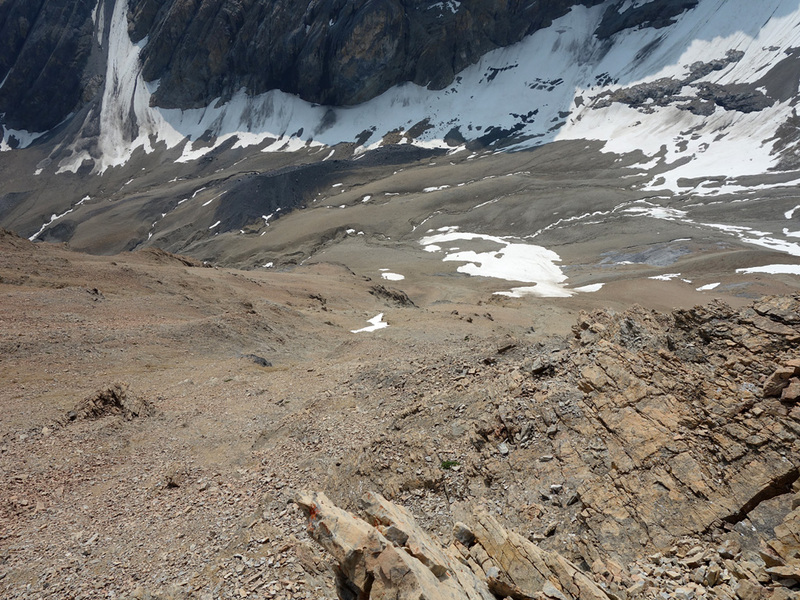 After having Hilda near the top of my list for a couple of seasons I took advantage of some unseasonably dry conditions in the Icefields area to mount an exploratory ascent. It wouldn't succeed, but I would learn a lot about this mountain in the process that can help myself and others in the future. Hilda's not for the faint of heart; indeed, it's for lovers of exposure! 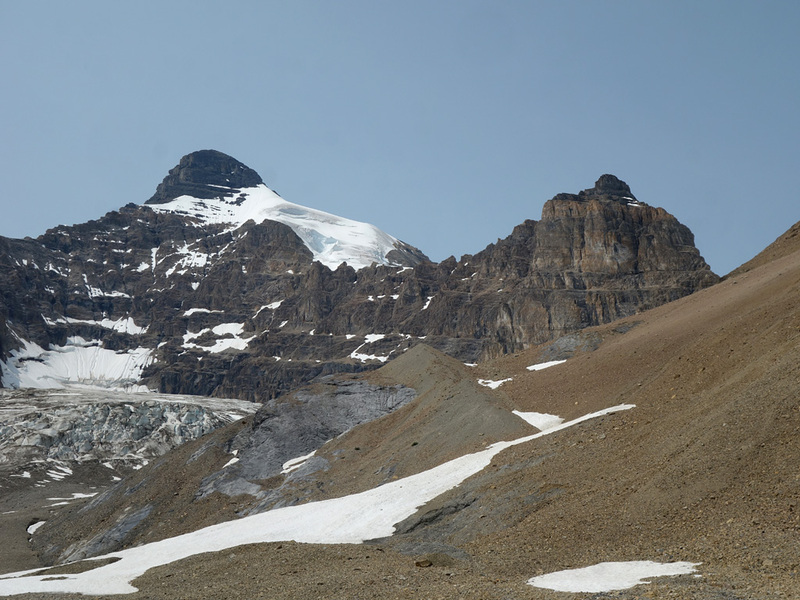 An attempt on Hilda Peak begins from the Hilda Creek parking area on the Icefields Parkway, 8km south of the Icefields Center. From the parking area head south along the road across Hilda Creek to a gravel road leading to the Hilda Creek Hostel on the west side. Once you reach the hostel you should easily spot an unmarked trail leading away past an open area to the right of the outhouse. For an obscure objective such as Hilda Peak, you'll be pleasantly surprised by the fantastic approach trail, no doubt owed to the many people doing the traverse/ski tour over the Boundary Glacier via the A2 col. 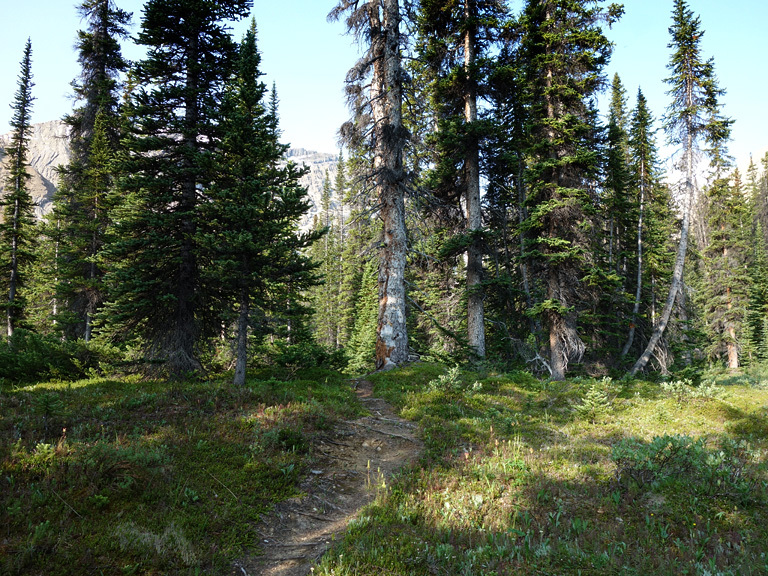 The trail follows Hilda Creek, is nicely bridged, and even continues upon reaching the glacial moraine right to where I began my ascent, about 2.5km from the parking lot near some mud flats. I chose to gain Hilda's southeast ridge shortly after passing the last of its forested area, using open scree slopes to easily gain the crest. 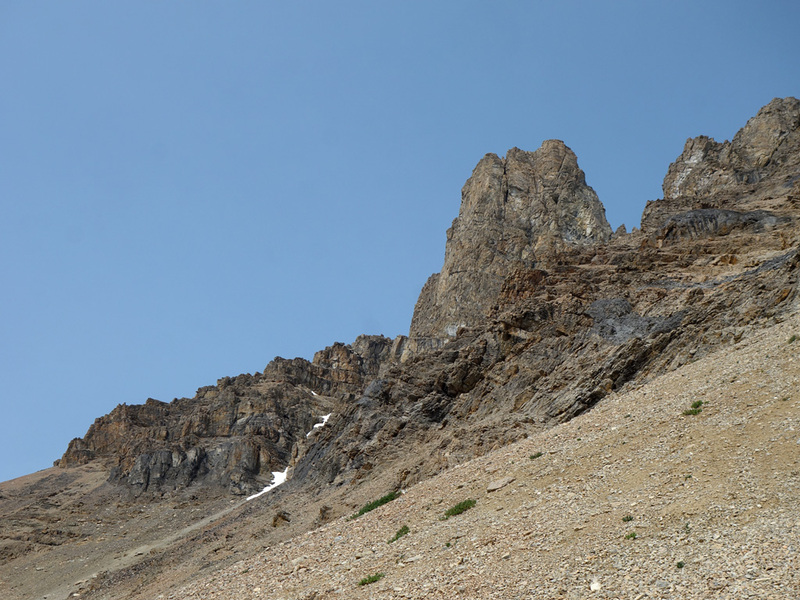 Up to that point, and at a number of intervals later into the climb, the southeast ridge can look rather benign and give you the false impression that you might easily hike the rest of the way to the summit area. 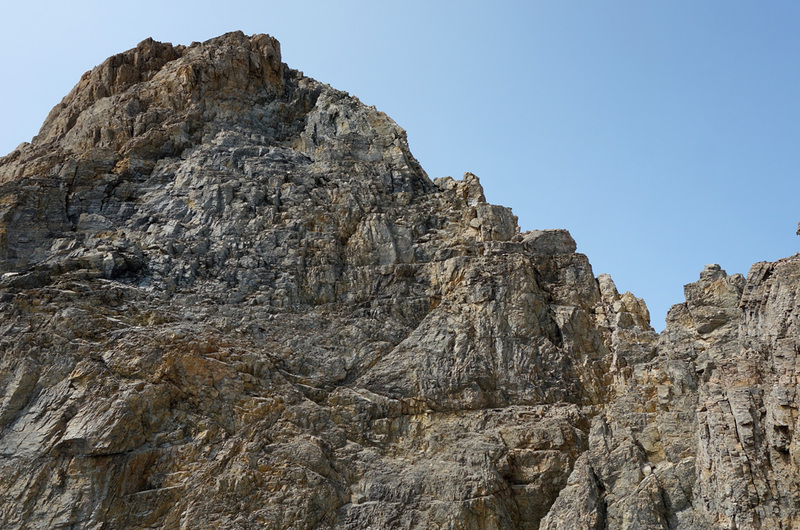 The reality is, however, that the southeast ridge is disrupted by a surprising number of high points and cliff bands, often requiring the traversal of narrow, exposed sections that overlook Hilda's huge eastern bowl. 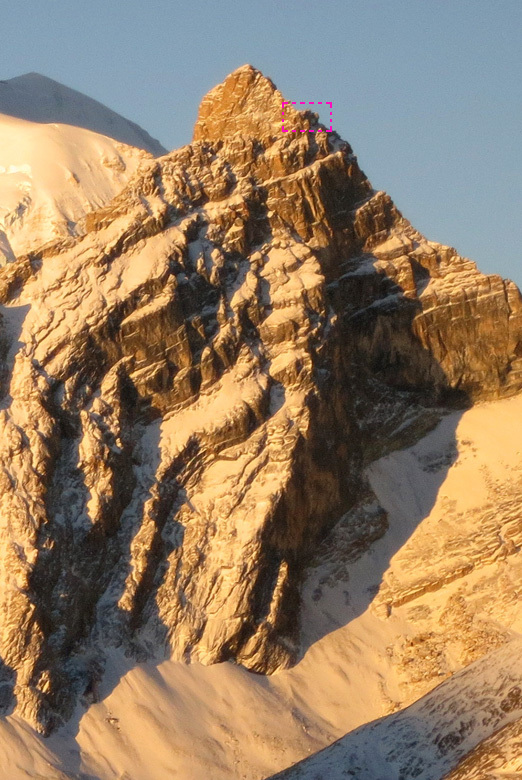 For the most part difficulties along the ridge can be bypassed on the climber's left. Roughly a third of the way up the ridge I encountered a very exposed 6m downclimb, with few visible holds, that forced me to backtrack slightly before descending 30m down scree slopes (on the climber's left) to a ramp that safely led me through the cliff band to an open slope I could use to regain the ridge. As you get further up the mountain the best lines around difficulties will begin to appear on the climber's right, where exposed, downsloping ledges provide an easier route than taking a difficult direct approach. Approaching Hilda's signature summit block with A2 and Mt. Athabasca to the left. The biggest surprise for me was encountering sections of trail and the occasional cairn on the way up. I was feeling pretty gassed from doing Aberdeen and Haddo the day before, and the high heat and humidity weren't helping any, but these signs of past human activity gave me optimism that the ascent was viable as I slowly ground my way up the mountain. 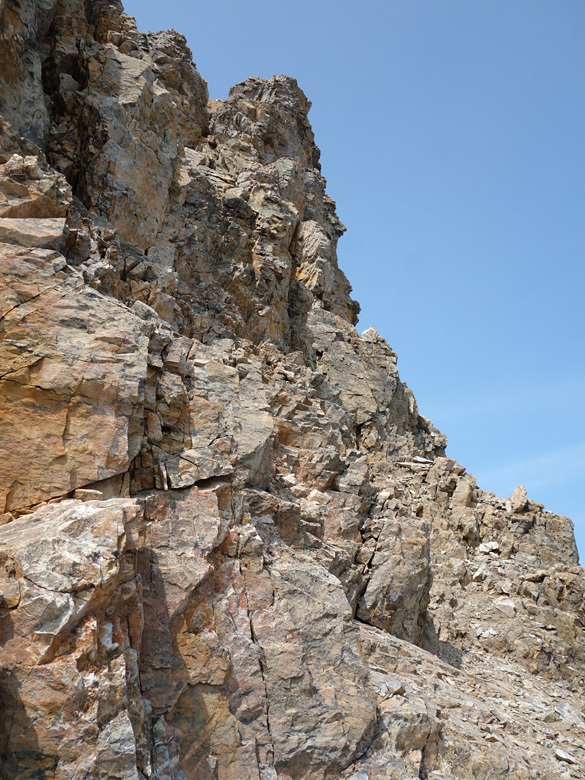 As I carefully made my way through one moderate/difficult scrambling section after another as I neared the summit, I hoped to myself that things would get easier once I was beyond the next obstacle. They didn't. Looking back along the narrow and exposed ridge from my turnaround point. Expecting a level traverse to the summit ramp I was dismayed to discover that it can only be accessed by crossing a narrow ‘L’-shaped rock fin, with about a 20-30º tilt to the right and a number of climbing steps, which is then followed by a ice-filled notch, which is then followed by a pinnacle (which may be by-passable to the left on snow/ice), and then, for good measure, yet another notch. Needless to say, the whole section is massively exposed with a 400m+ drop on the climber's left onto the last remnants of Hilda's glacier, and a 40m+ drop on the climber's left into a steep, snow-filled gully, which eventually drains into the moraine near the A2/Hilda col. 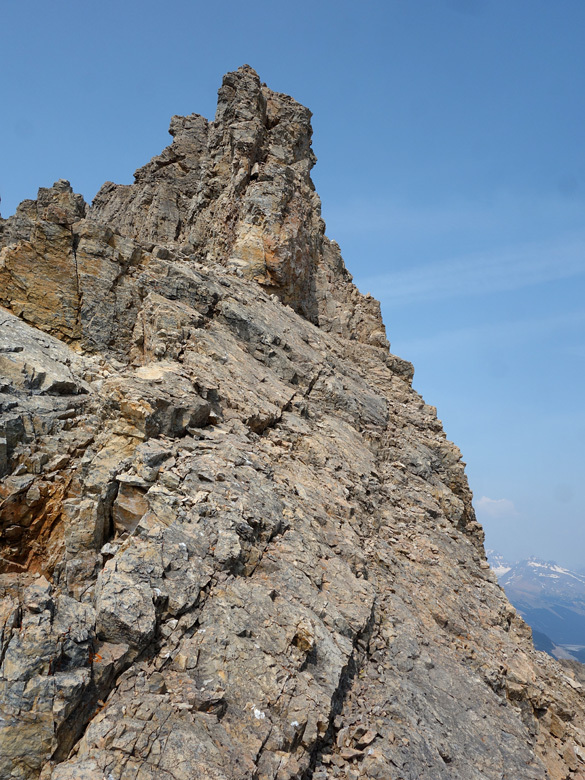 The last 50m of Hilda Peak are technically challenging and extremely exposed. I traversed the first section of the ‘L’ taking advantage of a level crack in an otherwise downsloping slab, bypassing the first climbing step on the left. From the bypass, there is a scramble route back to the top of the fin, but the rock's a bit chossy, the steps are debris covered, and the exposure is huge. The ledge at the base is short and downsloping, making any slip potentially fatal. My misgiving metre was already pretty high, particularly since I was on my own, and I also had to concede that making it past this section might only buy me another 20-30m of travel to the edge of the notch (which, without luck, would require a repel for sure). 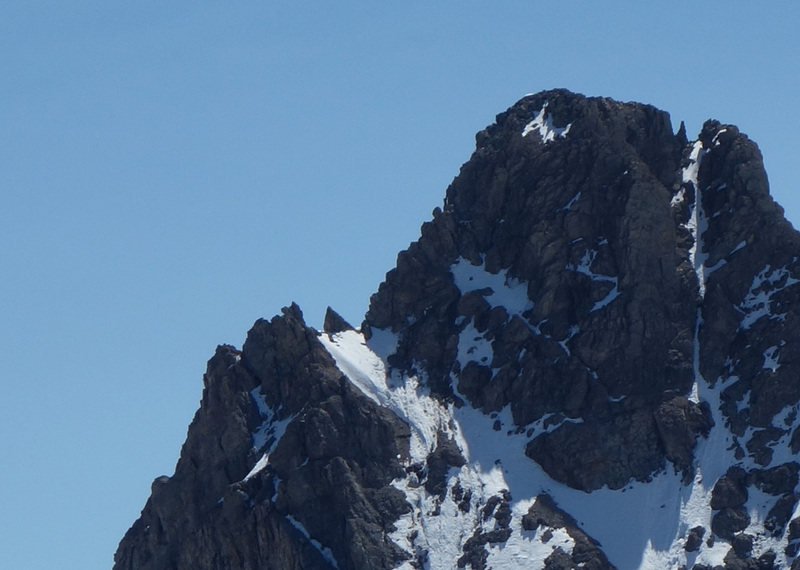 I saw no point in committing myself to a dangerous downclimb when summiting seemed doubtful, so I made the difficult decision to turn around, tantalizingly close to Hilda's summit which was at most 50m above. Update: A later party confirmed that the remaining portion ramps up to a 5.5 alpine climb, and involves multiple rappels. It's clear that many people have at least attempted to summit Hilda Peak, and perhaps the scarcity of beta is a result of very few people succeeding. My suggestion would be to, at the very least, have the necessary gear for a repel and to safely skirt the pinnacle on snow/ice, which would mean lugging an ice axe and crampons a long way in order to traverse a very short section. That, along with some steely resolve, should get you to the base of the ramp. What challenges await from there is unclear, but there looked to be a series of smaller rock steps followed by a larger cliff midway up. 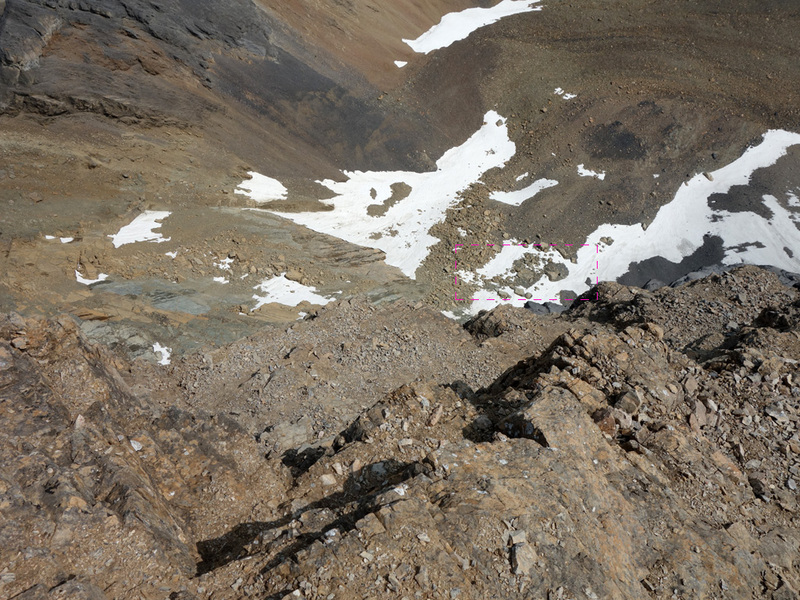 It may be possible to bypass some of these sections to the climber's left of the ramp on Hilda's southern face. I turned back and retraced my steps along the southeastern ridge, but not wanting to fight my way down the crest, I found a reasonably easy slope down Hilda's backside to the glacier valley between it and Mt. Athabasca. Note that what may appear as open debris field here can easily be rock covered glacier! 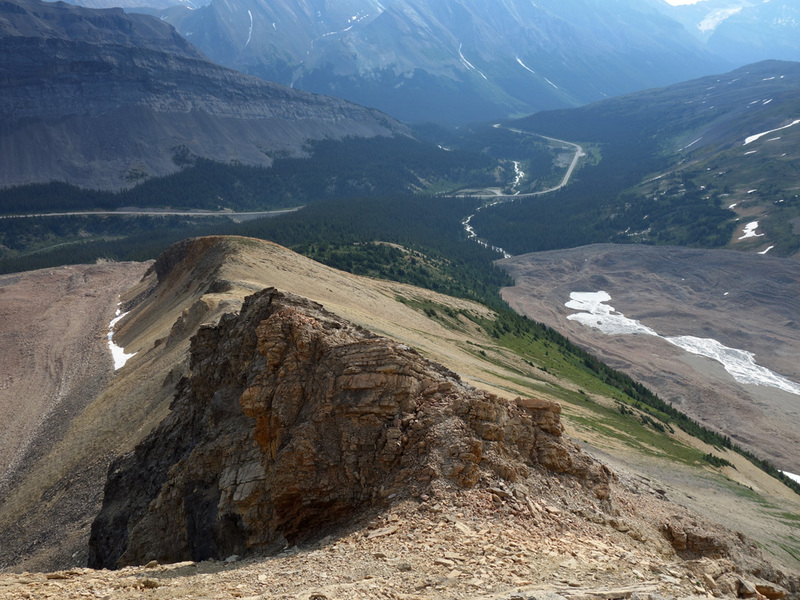 The hike out via the moraine valley was reasonably easy; however, I should have stuck to a higher line on the skier's left as I was forced to battle my way up a steep, concrete hard slope near the mud flats to regain the approach trail. Summit: 3,219 m / 10,561ft. Summit: 2,884 m / 9,462ft.